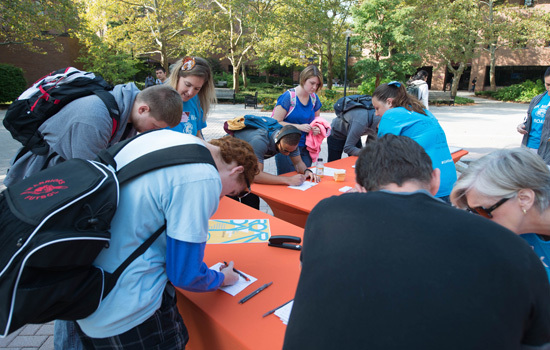 Students pledged gifts at a giving station on ROAR Day last year. Unleash your inner tiger and ROAR loud and proud on Oct. 1. This year is the 10th annual Raise Our Annual Responses Day, the official kick-off of the 2015-2016 Fund for RIT’s annual giving campaign. Since the launch of ROAR Day in 2006, nearly half a million dollars has been raised. To recognize the event’s 10th anniversary, event organizers have developed 10 reasons why members of the RIT community should give on ROAR Day. The top two reasons include a matching gift challenge incentive and supporting the RIT fund of your choice. Several members of RIT’s Board of Trustees have offered to match student, faculty and staff gifts of $5 up to $40, made between midnight and 11:59 p.m. on Oct. 1. Stations will be set up across campus where donors can make their gifts to RIT. Gifts can also be made online at rit.edu/roar. Campus donors who give $5 or more will receive a sticker for a free small scoop of Ben & Jerry’s ice cream on ROAR Day. Donors also can play a game for a chance to win some RIT gear and prizes. With hundreds of funds to choose from, donors are encouraged to direct gifts to their favorite area of RIT. In the past, the most popular areas supported by ROAR Day donors were student clubs and organizations, scholarships and academic programs. Students’ undesignated gifts will be directed to Student Government’s General Support Fund. Faculty and staff undesignated gifts will support RIT’s General Scholarship Fund. “Tuition dollars only support a percentage of the RIT student experience. When that funding runs out each year, the gap is made up by private support,” said Brenna Mangano Hynes, associate director of the Fund for RIT. The focus of ROAR Day is to encourage a cultural philanthropy on campus by educating members of the RIT community about the importance and impact of giving. Last year, ROAR Day had record-breaking participation. This year the goal is to reach 2,400 donors in 24 hours. For more information on ROAR Day, including a list of giving stations on campus, go to rit.edu/roarinfo.